Mount Chortiatis or Hortiatis (Greek: Όρος Χορτιάτη, Χορτιάτης), known in Antiquity as Cissus (Ancient Greek: Κισσός) or Kissos, is a mountain in Central Macedonia, Greece. It rises southeast of Thessaloniki, peaking at 1,201 metres. Besides the city of Thessaloniki, there are several suburbs and villages located on the foothills of Chortiatis, most notably Chortiatis and the affluent suburb of Panorama, both of them belonging in the Pylaia-Chortiatis municipality. The mountain's landscape is wooded, with part of these woods making up Thessaloniki's Seich Sou Forest National Park. A fall wind that occurs on the Thermaic Gulf was named after the mountain as well. 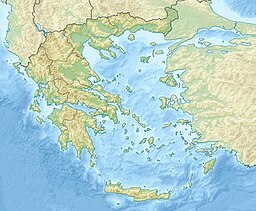 Mount Chortiatis played a crucial role for the water supply of Thessaloniki from ancient up until modern times. In the late Byzantine period (ca. 1300), the Chortaïtes monastery on the northern slopes of the mountain provided the city and the region east of it with fresh water by an aqueduct whose remains have been partly preserved.